Pizza cravings are some of the swiftest and sharpest around. When the hunger strikes, the best thing to do is grab the closest, greasiest slice you can find. Cheesy, carby goodness that leaves your plate see-through and your stomach happy. Other times, though, you want more out of pizza. You want the sort of pie where you can nearly taste the lifetime of obsession over water content and oven temperatures. The sort of pie where the mozzarella is homemade and the sauce isn’t dumped from a #10 can. The sort of pie, perhaps, where impossibly thin slivers of prosciutto take the place of those weird curled up little pepperoni bowls. Pizza is America’s great pinch hitter after a long day at work, but it can also be a true gustatory occasion. Thankfully, Pittsburgh has its share of serious pizza joints. These are places where pizza is treated with the same reverence as a perfect bouillabaisse or porterhouse steak, not cranked out, boxed up, and “pizza tracked” all the way to its destination. In short, here are seven spots to get a damn good pie. 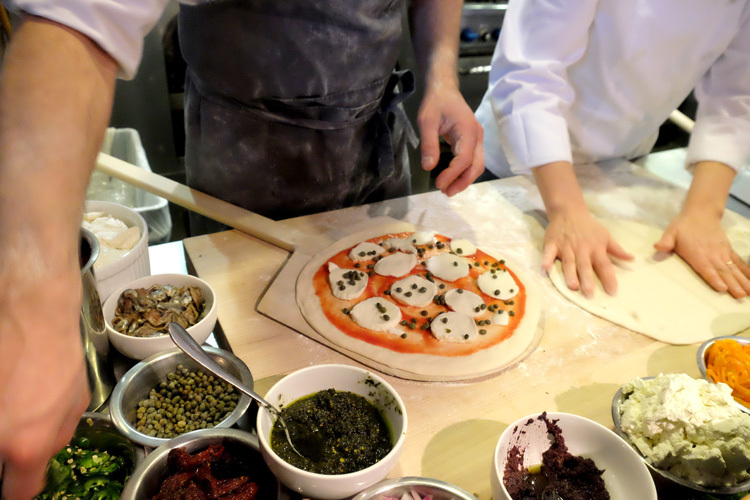 Lawrenceville’s Piccolo Forno does a lot of things well. From the fresh handmade pastas to the seasonal risotto, Piccolo is the cozy Italian place every neighborhood should have. But for me, no visit is complete without at least one pizza for the table. 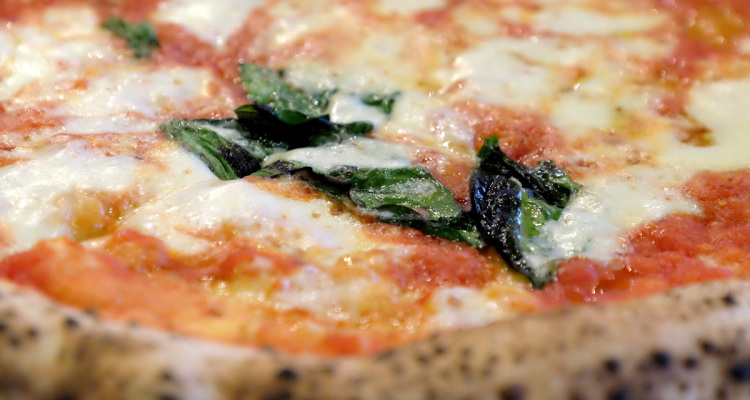 Blasted in their wood-fired oven, Piccolo’s pies sport the thin, blistered crust that’s the stuff of pizza dreams. As for which one to get? It’s hard to go wrong. The Quattro Stagioni, topped with separate quadrants of roasted red peppers, mushrooms, prosciutto and artichokes, is a good bet, or take a chance on their rotating special pie. Piccolo Forno gets justifiably packed most nights, so be prepared for a wait. With plans in the works for a wine and grappa bar behind the restaurant, that wait is about to get a whole lot more pleasant. I’ll admit: Proper took me by surprise. I hadn’t heard much about the downtown spot, and I had no idea what to expect when I wandered in for a solo weekday lunch. When I spotted the draft list, though, I knew I was in good hands. Their thirty taps span an impressive array of craft beers, more than half of them local, and the name of each beer is artfully rendered in chalk on a constantly changing list above the bar. But this isn’t an article about tap list typography. Of the many Margherita pizzas I tried (my baseline for comparison), Proper’s was the standout. From the house mozzarella to the tangy red sauce to the lightly charred basil, Proper’s Margherita pie proved why it’s been a classic for centuries. 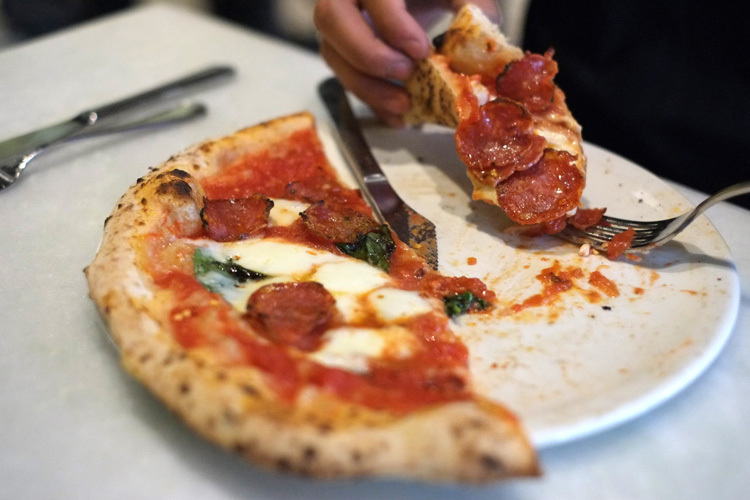 Though a relative newcomer to the Pittsburgh pizza scene, Proper has come out swinging. Pizza going into the wood-fired oven at Mercurio’s in Shadyside. Photo by Brian Cohen. Mercurio’s makes fancy pizza in a decidedly unpretentious setting. Maybe that explains why the Shadyside gelato and pizza restaurant was packed when we went for dinner on a cold Monday night. Or maybe it’s that crust. The most notoriously finicky part of the pizza making process, Mercurio’s has nailed the chewy, slightly sweet foundation to their pies. The price is also a big part of Mercurio’s appeal. 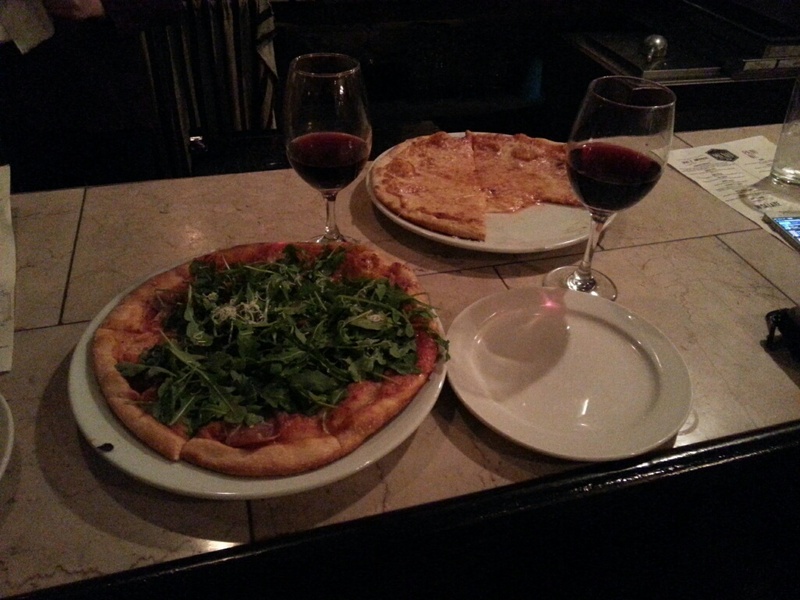 The pizzas are cheaper than nearly any other brick oven place in town, and the wine list is as accessible as it gets. Add to that friendly, prompt service and a wide array of homemade gelato, and you’ve got one more reason to go to Walnut Street. Authentic Napoli pizza at Il PIzzaiolo. Photo by Brian Cohen. “Il pizzaiolo” translates to “the pizza man.” Not a pizza man, mind you. The pizza man. It’s a title that fits Ron Molinaro well. Since opening Il Pizzaiolo in Mt. Lebanon nearly twenty years ago, Molinaro has become Pittsburgh’s guru of authentic Neapolitan pizza. Though his original location–which boasts a wine bar in the back and one of the best terraces in town–is still going strong, we dined recently at the newer and dare I say hipper restaurant on downtown’s bustling Market Square. And it was there that I learned of cheeseless pizza. Quite contrary to greasy, gooey food court pizza, several of Il Pizzaiolo’s pies were nearly naked. It’s a gutsy play. After all, mounds of cheese cover all manner of sins. But on our Santa Lucia pie, a symphony of potent garlic, capers, anchovies and olives, cheese was wholly unnecessary. Every ingredient is carefully sourced, and even the capers tasted better than I ever imagined a caper could. The margarita pizza, with buffalo mozzarella is not to miss and the NEXTpittsburgh publisher swears by it. 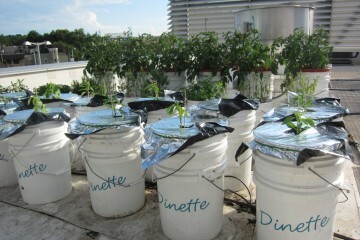 Toss some arugula on top, order one of many wonderful fine wines and you’ll think you’re in Naples. The pizza at Cucina Bella in Bridgeville. Photo by Tracy Certo. Bridgeville’s Cucina Bella has the feel of the New Jersey Italian restaurants where I spent much of my youth. It’s homey and family-driven, and the eclectically decorated dining room vibrates with the happy noise of clanking silverware and satisfied grunts. The only difference? The pizza was never this good. Cucina Bella’s menu features more than two dozen red and white pies, ranging from traditional favorites to creative house specialties. The Torta di Dom, named after Piccolo Forno’s Domenic Branduzzi, is a particular favorite, marrying smoked speck and creamy mascarpone. 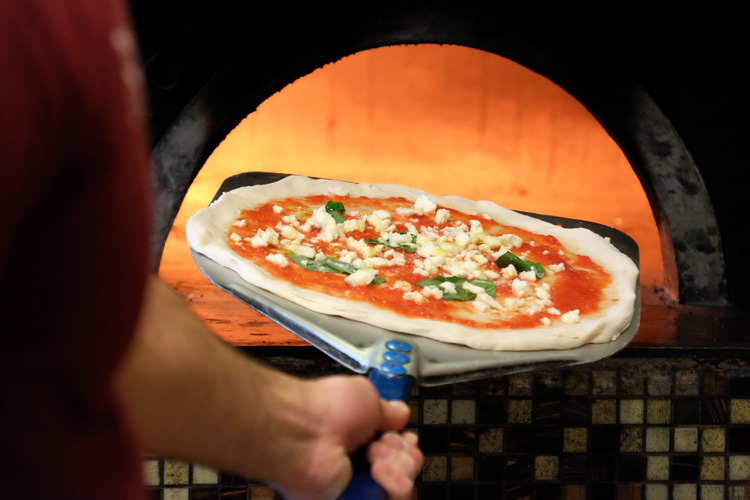 No matter the pizza, Cucina Bella’s commitment to quality ingredients and proper technique–three days for the dough to rise– is evident. Though it might look like your average suburban Italian place from the outside Cucina Bella’s food is anything but typical and the atmosphere is quite inviting. We’ll be back. 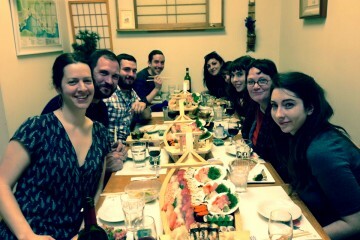 Dinette opened in 2008 and, over the past six years, has quietly established itself as one of the best restaurants in Pittsburgh. Admittedly, Dinette would be easy to overlook. Tucked up near the East Liberty Chipotle and with the sleek, airy look of a trendy store, Dinette’s environment is a bit at odds with its charming, rustic menu. But oh, what a menu it is. A handful of starters, such as a stellar fritto misto, whet the appetite for—what else?—pizza. The eight or so pies change regularly depending on the seasons and the whims of chef Sonja Finn. The pizzas are simple but inventive, built around a single ingredient accented with pops of flavor from cured meats and produce from their own rooftop garden. With its relaxed vibe and five-star food, Dinette brings fine dining and corner pizza parlor together in one delicious package. Sure, Slice is a bit of a departure from the fancy brick oven spots. But if you’ve been there, you know why it made the list. Slice on Broadway is, naturally, on Beechview’s Broadway Avenue, and it looks like your average New York style slice shop. My go-to order is as simple as it gets—two big slices of cheese pizza. When it’s this good, who needs toppings? The crust is ultra-thin and ultra-crispy, the perfect vehicle for rich red sauce and a bubbly, browned layer of cheese. And those two slices will run you less than five bucks. Slice is a hole-in-the-wall pizza parlor that can hold its own against the larger, ritzier competition. And considering they opened a second location in Carnegie earlier this year, I guess I’m not the only one who thinks so. There are plenty more great pizza spots that I’ve left out, so let the comments roll. And because this is pizza we’re talking about, we’ll add some readers’ suggestions here. Take note: some of Pittsburgh’s best pies may be in the not-so-distant future. Rick Easton, whose much-lauded ‘za has only been sporadically available at the Livermore, is opening the doors to Bloomfield’s Bread and Salt before the end of the year. Over in East Liberty, Pizza Taglio, which will serve Roman-style pies, is slated to open later this month. And keep an eye out for more from the Pizza Boat, though whether that’s a brick and mortar restaurant or more of their excellent mobile, wood-fired pizza remains to be seen.